Nakagawa was founded in 1951 by the father of our current chairman and CEO, Mr. Yuzuru Isshiki. In 1987 Nakagawa Manufacturing (USA), Inc. was established in Hayward, California. We convert and sell all types of recording paper used in Point of Sale receipt terminals, ATM machines, office automation, medical engineering, factory automation, digital graphics, and other applications. 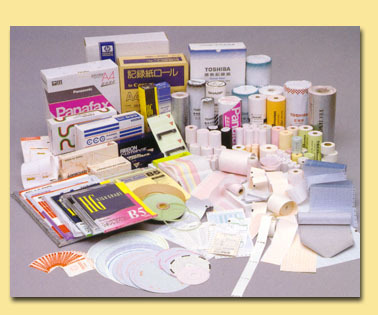 Since 1958, Nakagawa Manufacturing has been a pioneer in the paper converting industry. By consistently leveraging the latest technological advancements, Nakagawa has grown from a small paper-converting factory in Japan, to a successful international corporation. It is our goal to give you the best products for your applications. Our global operations in Japan, the USA, Hong Kong, Vietnam and Germany will provide you with the support you need to successfully implement your product strategies the world over. Nakagawa's philosophy has remained unchanged throughout its history. We give "Total Quality" to all our business partners. We uphold value in our products because we value our customers, and consistently exceed high expectations with high quality! At Nakagawa Manufacturing (USA), Inc., we design, develop, and deliver top quality finished paper products. We work hard to meet all of your requirements. We produce only top-quality products! Our specialization in thermal papers has allowed us to work with top-notch customers in ticketing, tags, labeling, and items that require a high resolution bar code. Through our superior production and customer service we supply everything from cashless-currency, or e-tickets, to municipal parking tickets. We also specialize in Point of Sale products such as two-ply cash register receipts, Point of Purchase products such as in store tags, and medical and industrial charts. We provide ONLY top-quality service! We will be your chief information center for updates on the paper and pulp industry, and dedicate ourselves to helping make your products better and processes more efficient with the most appropriate finished paper products for your requirements. Our production facilities are fully equipped with the latest in paper converting technology, and we have a vast amount of expertise in selecting the right materials for the project at hand. Our equipment in our Hayward factory is nearly identical to that in our Mito, Japan factory pictured below. © Copyright NAKAGAWA Manufacturing (USA), Inc. 2004. All rights reserved.